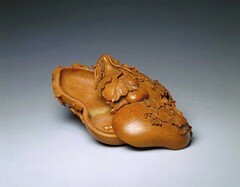 Carving is one of the oldest crafts developed by mankind. 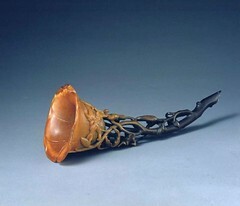 Archaeological excavations and literature sources show that early primitive societies had already learned to make utilitarian or decorative objects out of materials readily available in nature, such as jade, stone, bamboo, wood, ivory, horn, and bone. Different materials, comprised of varying properties, call for different ways of applying knife-work. 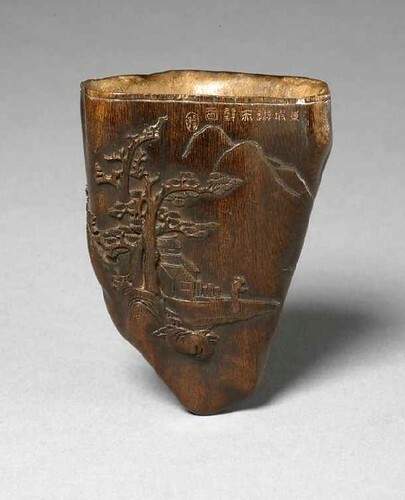 Among the various carving arts, those of bamboo, wood, ivory, horn, and fruit stone have most in common and are closely related. 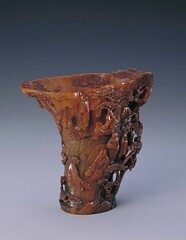 Since the mid-Ming dynasty in the sixteenth century, they have emerged and developed into a unique, independent category of the arts. 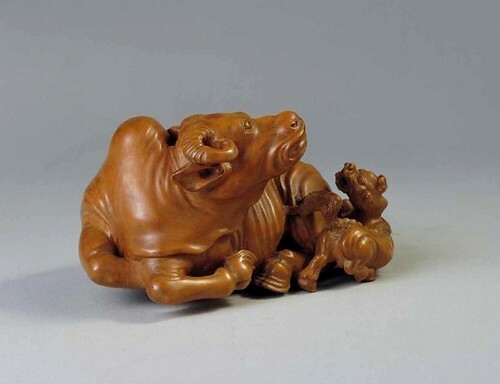 The origin of the arts and crafts goes a long way back, but the remote picture prior to the time of Yin-Shang dynasty (1600-1046 B.C.E.) is vague. 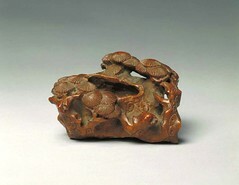 In the subsequent Zhou dynasty (1046-221 B.C.E. 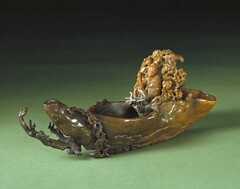 ), the "Hundred Crafts (百工)" were administered under the Office of Winter (冬官). Thereafter throughout different dynasties, the official sector of the trade had its ups and downs, while the private operations went on with a certain degree of steady progress. The Mongolian rulers of Yuan dynasty (1271-1368) dismantled all these. A new registry system was set up consisting of three different types of "Artisan Households (匠户)". There were also appointed government agencies in charge of the registered artisans. The centralized management and convergence of various talents thus gave rise to inspiration as well as stimulation in all crafts. 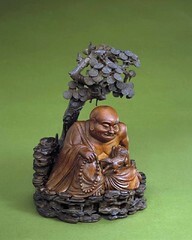 Ming dynasty (1368-1644) inherited and adhered to the Yuan registry of artisan households, forbidding any changes. The status of registered artisans was therefore on the books and hereditary; however, individuals of special distinction could still become government officials, or hold equivalent office titles, if their talents were greatly recognized by the emperor. There were also members of Ming's learned class, though at the top rank of traditional Chinese social hierarchy of four classes (learned, farming, crafts, and trade, in this order), who did not think it beneath themselves to engage in "handicraft" projects. By the time of late-Ming, some of the artisans had not only built a good business and fortune on their craft specialties, but also achieved a status of being on equal terms with the literati. The old rigid class registry half-dead, ambitious artisan families striving to enhance their own social standing, and the cultured and enlightened granting their approval and admiration accordingly, all these together contributed to the demise of a system which had become irrelevant long time ago. 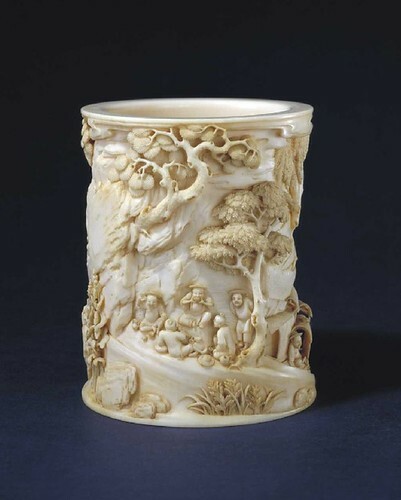 On May 19th, 1645, the new ruler Manchurian court ordered the elimination of the "Artisan Household" system. 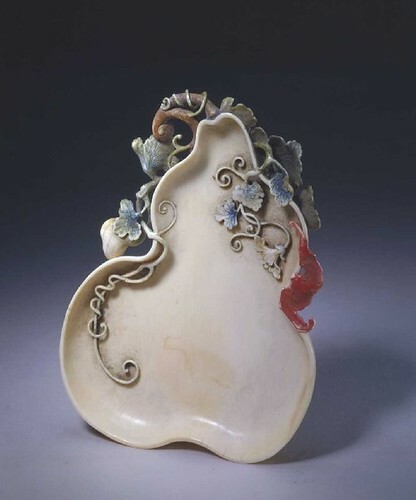 Back in mid-Ming, with their identity being confined, the artisans with outstanding talents could still gain recognition from the emperors and appointments to high offices. People who felt motivated to achieve thus saw opportunities for betterment. 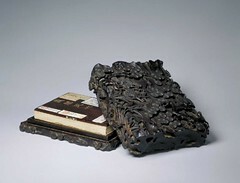 Quite a number of professional artisans in the Ming period were well-read, earnestly seeking acceptance by the literati. Yet still, to socialize with the latter group, for these aspiring initiates, retaining their own specialties of crafts was the entry ticket as critical as having good learning. 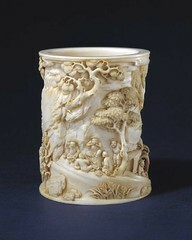 As a result, with the emperors and the literati playing enthusiastic advocates, and through the effort of the motivated artisans themselves, carving and all other crafts experienced a new and robust period of advancements after mid-Ming. 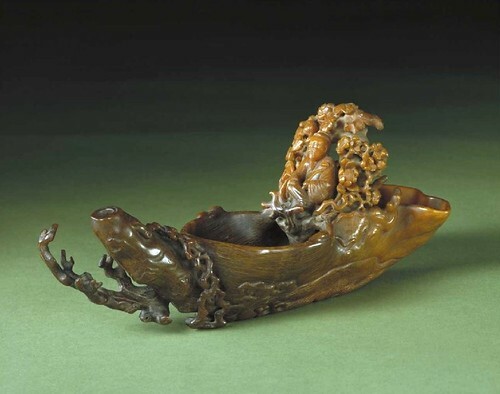 In the Qing dynasty (1644-1911), throughout the reigns of Kangxi, Yongzheng, and Qianlong, with the emperors as sponsors the carving artisans who served at the Workshops of the Imperial Household Department brought their originality and ingenuity into full play. Outside the palace, the private studios also made their unceasing effort and contribution thanks to the patronage of the literati gentry and rich businessmen. 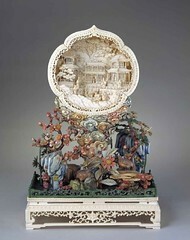 All these combined to take the carving arts to an unprecedented finesse and sophistication. 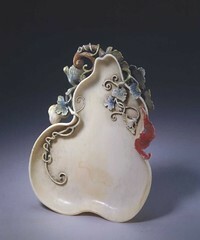 At the Qing court, the unique specialties of the Canton ivory artisans (linked chains, "live" patterns, floss weaving, and the layered concentric ball) even earned an appellation of "Celestial Feat (仙工)". In summary, after mid-Ming when the carving arts as a whole had claimed an independent status in its own right, under the support and patronage both from within and without the court, the carving artisans continued to further their ingenuity and refine their skills, eventually winning themselves the extolled status of "Celestial" workmanship.